The Earth’s climate has undergone change in the past but never before have humans had such an influence on climate change as they do today. In the past the earth’s climate was affected more by natural occurrences such as volcanic eruptions, changes in the earth’s orbit, & variations in the amount of energy given off by the sun. This site is dedicated to informing and educating it’s visitors about climate change and how it affects our planet and it’s residents…us! Please show your support by telling others about this site and by taking an active interest in what you can do to to take care of the earth that we all live on. SaveOurClimate.org is introducing the all new Universal Climate Symbol in order to help unify organizations that support various efforts that tie into the effort to effect positive changes that will ultimately effect our climate. So many different types of organizations approach various efforts whether they be for clean energy, energy efficiency, reducing emissions, using alternative building methods which reduce our carbon footprint, or just about any other “green” project most of them are intimately linked to reversing the damage done which is affecting climate change. Anyone can use this image but there are some restrictions in it’s use. Individuals may use the symbol in any non commercial way they wish. 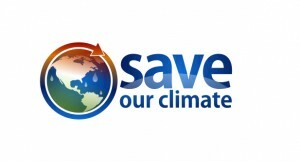 Non – commercial organizations can use it freely in all communications about climate change whether via print, electronic media, or the internet. We ask only that if you use the logo in online media you also provide a link back to this website and approved link code will be provided through this site. Commercial Organizations must request and be approved to use this logo in their promotions of any sort. Media & Media Companies may use the symbol to inform the public about it’s use. Any other than what is published here must get permission through the owners of this website to use the symbol. 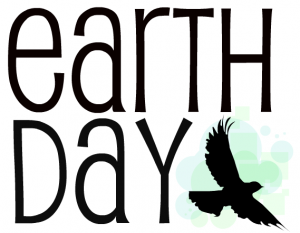 Today is Earth Day & The Earth Day Network the organizers of Earth Day initiatives around the world have declared Earth Day 2011’s theme “A Billion Acts of Green®”. They have so names the theme in the interest of promoting their goal of 1 billion acts of environmental service and advocacy. 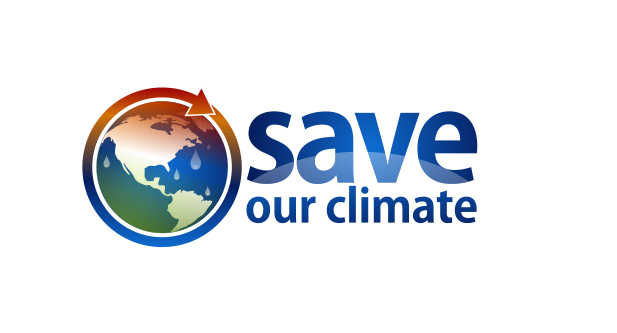 SaveOurPlanet.org is all about environmental service and advocacy in the interest of reversing the harmful effects of climate change and of course in the interst of a better place for us and our children to live. Make sure you do your part and for ideas and suggestions on how you can help out / take part on April 22, 2011 and beyond head over to earthday.org. And why not add the universal climate symbol to your activities as well to show your full support and dedication to making the earth a better place. Just How Much Do Building Practices Effect Our Climate? One might wonder just how much modern building practices effect our climate and this article will hopefully point you in the right direction to get all the answers that you need. So just changing building practices to more green methods in North America can effect a huge change on huge factors that affect global climate change. So not only does it reduce the pollutants that cause global warming but will drive further devlopment economically and improve overall environmental conditions leading to further benefits. As with any efficiency effort it would also lead to a more secure future in this case in terms of energy. A Swedish study was cited that showed that huge cost savings could result from upgrading insulation, water heaters, and using energy efficient lighting. While we know that this was a Swedish study similar results should be had by making similar changes in North America. The report brings out some very interesting facts and information on how green builing practices can further benefit the world in the effort to reduce greenhouse gas emissions and certainly worth a read. You’ve probably heard and seen conflicting points of view in the media outlets from both sides of the climate debate and for many the information can be quite confusing. So we have assembled a collection of well done videos explaining where the debate comes from and actually how much of it is based on real scientific research and how much of it is noise from media outlets and reactions to that noise making even more noise. It examines both sides of the debate and should help you decide or at least give you some motivation to do some research for yourself into actual sources used by climate change skeptics as well as know the real sources for proponents of climate change. Whether you realize it or not climate change has affected you! While you may not feel like things have changed climate change evidence is all around and so are the effects of it. While this article won’t examine the causes of climate change it will help you to see that evidence of climate change is all around. Ice is melting all over our globe and fast (relatively). This includes not only ice at the North & South poles but also glacial ice found in mountainous areas. Sea levels have risen and continue to rise more quickly. Plant & animal species have suffered and / or are having to migrate due to unfavorable climate for their specific species. Rainfall (and snowfall) has increased on average globally with more rain happening in areas that typically get a lot of rain. Hurricanes & Typhoons have increased and will increase in strength if not in number. The temperature has risen approximately 1 degree Fahrenheit on average globally. While the effects may not seem so much of a big deal and this is not some doom and gloom Armageddon message it is cause for much concern. The delicate balance in areas that we live, work, and the areas that provide the raw materials that we consume (plant based matter for everything from food & clothing to building materials) is being affected and these resources can be impacted negatively. An example might be the spruce bark beetles that have infested so much of Alaska’s Spruce that it has been called an outbreak by Alaska’s Division of Forestry. Although this is not expected to affect most areas that produce food in the US in a negative way, many areas in developing natures will likely suffer and some indications of these effects have already been seen in certain regions. For regions that are negatively impacted this can cause price increases for the crops effected with obvious ramifications for those most in need of these resources. One of the other evidences of that change mentioned earlier was the rising sea levels which has caused significant troubles in many areas to coastal areas as can be seen in the below video. In one way or another the effects of climate change is becoming more noticeable to every area of the globe and the increasing awareness of these issues should drive us to make a change. Do your part in the effort to reverse the negative factors that are influencing the change in our Earth’s climate and use the “Universal Climate Logo” In your communications. The earth naturally has a layer of greenhouse gases which are important to maintaining the temperature of our earth and supporting life as we know it. The main components of that “greenhouse” layer might actually be a bit of a surprise to you. It is actually water vapor. However the occurrence of water vapor in the atmosphere is viewed more as a changing variable that occurs in the atmosphere more in response to other more long lasting gases like carbon dioxide, methane, & nitrous oxide. Most scientists agree that the activities that we partake in that contribute to the release of these gases is what has the largest effect on our changing climate. The most significant changes to earth’s climate change have occurred since the start of the industrial revolution. Of the above gases human activities directly contribute to a large degree all but the water vapor which is called a “feedback” in the system or it could be said changes based on how much of the other fases are introduced. Let’s first examine carbon dioxide. While carbon dioxide is actually a minor component in the atmosphere it plays a major role. While carbon dioxide is released through natural means like breathing and volcanic activity other human activity has made a much larger contribution to this greenhouse gas in our atmosphere. 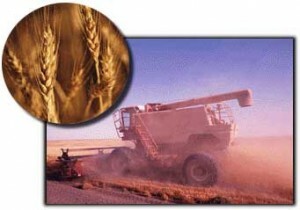 Two of these contributing activities are the burning of fossil fuels (like coal & oil) & deforestation. The next gas is Methane. As you can see human activities are large contributors to the increase of this gas in our atmosphere. Nitrous Oxide is primarily produced by such human activities as fossil fuel combustion, the use of chemicaland organic fertilizers, nitric acid production, & biomass burning. And the last greenhouse gas we will cover is Chlorofluorocarbons (CFCs). CFC’s are 100% synthetic compounds and 100% a product of modern industry. They are now largely regulated (internationally) due to their environmentally destructive nature and to their threat to our o-zone. 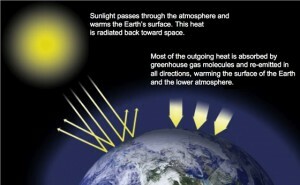 They are however still a greenhouse gas and pose a threat to our environment and to our climate. As we learn more about the effects of these and other greenhouse gases we continue to learn more about their direct effects on our climate. The next article will be on how climate change effects our planet. Green Building & Climate Change? Some might wonder; “What on earth does the way I choose to build my home have to do with climate change?”. The answer; The way most of us in developed countries live has a large impact on climate change and that includes the way we build our homes. It includes the materials we use and the processes used to produce them. It includes the amount of waste produced from typical construction methods. It includes the appliances we use to store food, wash clothing, etc. It includes the types and amounts of energy we use to power those homes, and one might even go so far as to say that it includes a host of other seemingly unrelated factors that in some small way impact other areas of our lives that contribute to the overall problem. In order to address the problem of climate control we need to consider our overall carbon footprint which means evaluating overall how we live. Don’t panic though because just like any other big change, it starts with making little changes that all together add up to a big result. The sustainable building / development articles of this site are intended to inform and educate visitors on what they can do to effect climate change by making changes in the way they approach the problem of providing adequate, comfortable, and practical shelter.